Thomas Jefferson appointed Augustus Woodward on March 3, 1805 as the Michigan Territory's first Chief Justice. The judge arrived with the city in ruins from a devastating fire. “ the bases of the town …shall be an equilateral triangle,having each side of the length of forur thousand feet (1200 meters), and having every angle bisected by a perpendicular line upon the opposite side”. 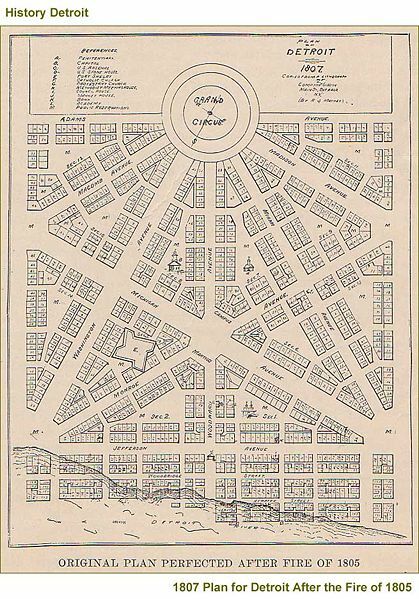 Woodward’s hexagonal grid plan for Detroit, 1807. Citizens who had lost their homes were given larger pieces of land. The idea was that additional hexagons could be added one as the city grows. But this plan was abandoned after just 11 years, and a grid street pattern was superimposed over the hexagonal design.